I recently received a message letting me know I was nominated for the “Sunshine Award” by Agata from http://agatasartcorner.com/. 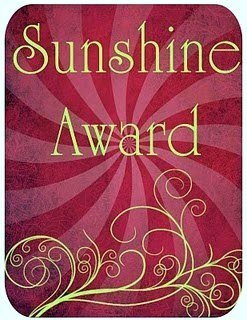 The “Sunshine Award” is awarded to bloggers who “light up the dark corners of our minds” and “positively and creatively inspire others in the blogoshphere”. Which is just wonderful, because I think that Agata actually fits that bill perfectly, and if you visit her blog, I know you’ll agree. She’s so creative, inspiring, and genuine and I just love reading her posts. Thank you so much Agata! 1. Thank the person who gave you this award in one of your blog posts. 2. Fill out the Question & Answers below. 3. Choose up to 12 bloggers to pass this award on to. What is your favorite color? I have so many. Seriously, I love nearly all colors, and it depends on my mood which is my favorite at any given moment. Right now, I’m huge on that bright aqua/teal/darker-than-robin-egg-blue color. What is your favorite animal? These are really hard questions! I love my dog and cats (and lizard), but as far as admiring from afar goes.. Owls. Hands down. Always have. What is your favorite number? uhhmm. sadly, none really stand out to me. What is your favorite non-alcoholic drink? coffee. It’s a daily requirement. I’m also huge on green tea. What is your passion? Photography. And any type of art. I love to paint, I love to draw, I love making jewelry and clothing and anything I can think of. So I guess more accurately, creating is my passion. Do you prefer giving or receiving gifts? Giving. And I love making them, or at least putting them together. Nothing makes me happier than making things for people! And now I nominate some inspirational folks who’s posts have left me with a sunny feeling inside!